We all love chicken wings. Crispy, full of flavor, and so simple to make at home, these crispy baked chicken wings are perfect as an appetizer, or full fledged supper meal. Best served along side a salad (such as this Greek salad, or this Kale Slaw), oven baked chicken wings have the advantage of not being overly greasy (and therefore healthier), but also much easier to make at home then deep fried wings. What’s your secret to making PERFECTLY crispy oven baked chicken wings? 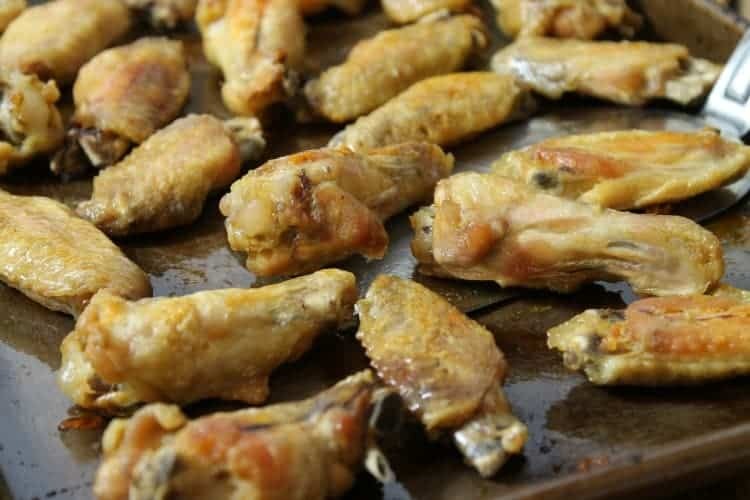 How long do you bake chicken wings in the oven for, and at what temperature? I’ll answer these questions below and give you a foolproof recipe you can easily throw together at home along with a few flavor suggestions! Many newer recipes you’ll find will tell you to toss the chicken wings in baking powder, because it helps draw out moisture, creating a crispy skin. While the science does hold up, the problem in this case is flavor and texture. While it’s true the wings get crispy at first, once you chew on them a little the skin goes leathery. Many people also complain of a bitter taste when using baking powder. This is caused by the sodium aluminum sulfate, which many people are flavor sensitive to. My secret? Parboiling the chicken wings first! 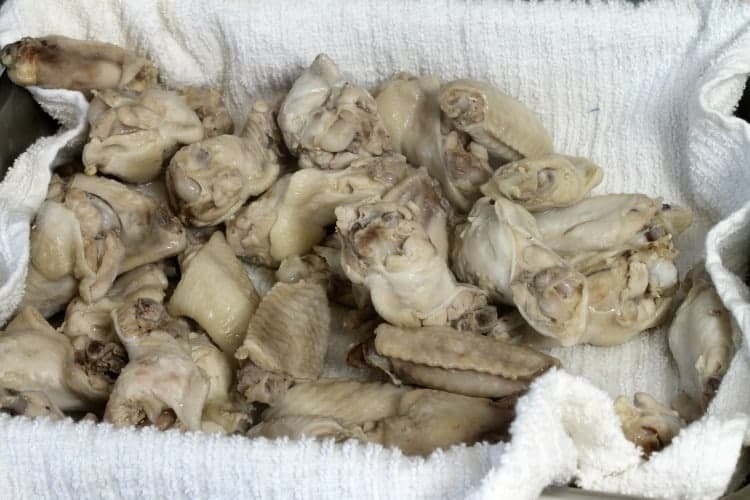 While this may seem counter intuitive at first, parboiling the chicken wings helps render out some of the fat in the skin, allowing the skin to crisp up that much faster. Since the meat is already 80% cooked from parboiling, the wings will give off much less moisture and only need to crisp up in the oven. It is of course essential that you pat dry the the chicken wings very very well before baking in the oven. If they are still wet, we are back to square one. I like to use a cotton cloth to give each wing a little squeeze, but you can also use paper towel. Once the chicken wings have been parboiled and dried, you can toss them in a little oil and spice to infuse some extra flavor. How Long Do You Bake Chicken Wings In The Oven? This is a bit of a tricky question because it depends on what method you are using to cook them. Convection ovens (with a fan) will also cook wings faster since the air is hotter, then a conventional oven (no fan) so you may need to adjust cooking times based on that. If you are parboiling the wings first as in this recipe, you will only need to bake the wings for about 20-25 minutes at 450F. 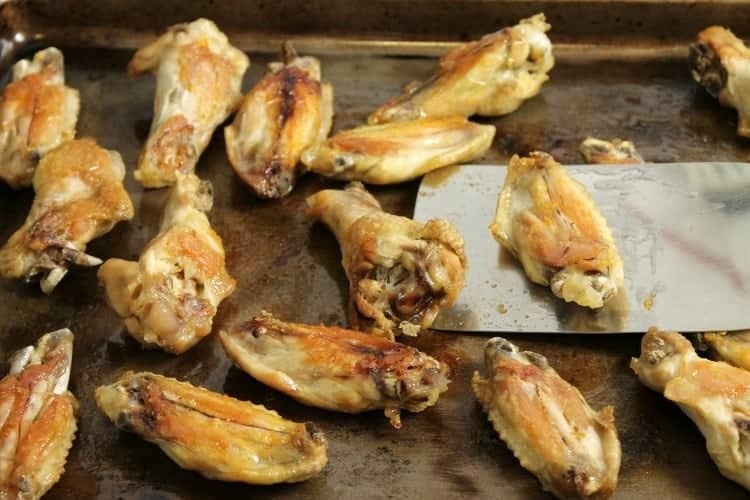 If you are just straight baking the wings tossed in seasonings and oil, you’ll need to bake them for 30-40 minutes at about 400F to get them crispy, or bake them for 40-50 minutes at 350F while turning periodically. If you are tossing the wings in baking powder (not recommended, see notes above ), you’ll need to first bake them at 250F for 20-30 minutes first, then raise the temperature and bake them another 40-50 minutes at 425F. In other words go with the first option on that list for best (and fastest) results! Lets get to it shall we! You’ll need about two pounds of chicken wings to feed 4 people, but you can easily do more or less if you like. 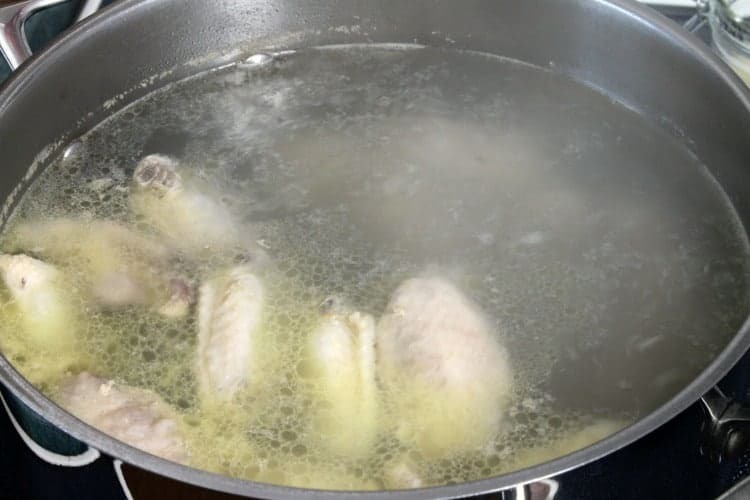 Drain the blanched chicken wings in a colander or sieve, and let all the water drip off. Pat the wings dry really well with a clean linen cloth, or paper towel. It’s important the wings are quite dry, so give them each a little squeeze with the cloth. Arrange the parboiled wings on a lightly greased sheet pan. Avoid using parchment paper or silpat, as the wings will not crisp up the same as if they are directly on the metal tray. 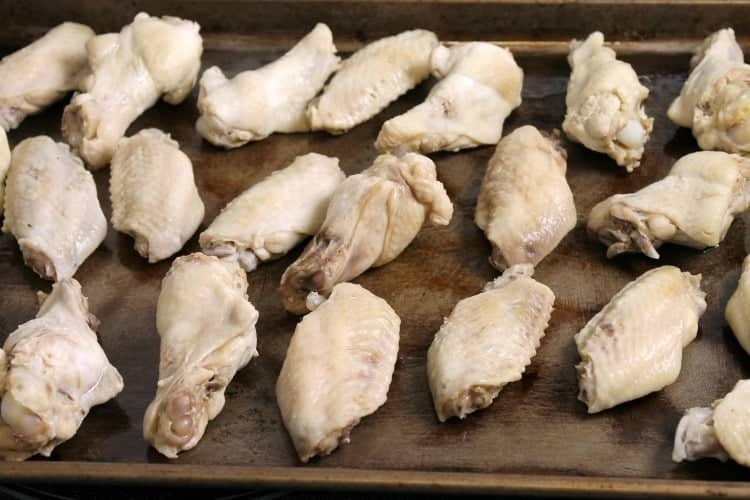 Bake the wings for 20-25 minutes until they start to brown on the bottom. Then using a metal flipper or spatula, turn the wings and bake for another 10 minutes. Serve the wings hot, tossed in your favorite sauce or seasoning spice. I love eating my wings dipped in BBQ Sauce or a homemade Ranch dressing. As always it’s best to serve the crispy oven baked wings hot straight from the oven! You can parboil the wings ahead of time, and keep them in the fridge over night. I would not recommend baking the wings and then reheating them though as they will dry out if baked twice. 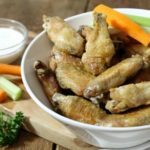 Are Oven Baked Chicken Wings Healthy? Compared to deep frying wings, yes these are relatively healthy. Of course if you slather them in sauce they won’t near as healthy as if they are served tossed in a simple spice mix, but that is the beauty of cooking for yourself. You get to make the decisions! What Else Can I Serve Oven Baked Chicken Wings With? While chicken wings make a great appetizer or finger food, you can easily make these oven baked wings and serve them alongside some grilled shrimp skewers, Kale Slaw, and Bajan Rum Punch for a truly awesome BBQ. Of course the classic carrot sticks and celery are always a nice touch and a few dipping sauces are never a bad idea! 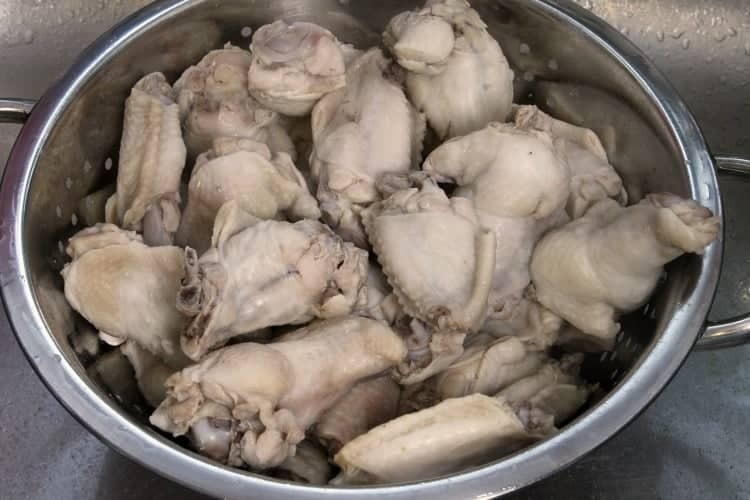 Drain the blanched chicken wings in a colander or sieve, and let all the water drip off. Pat the wings dry really well with a clean linen cloth, or paper towel. It's important the wings are quite dry, so give them each a little squeeze with the cloth. 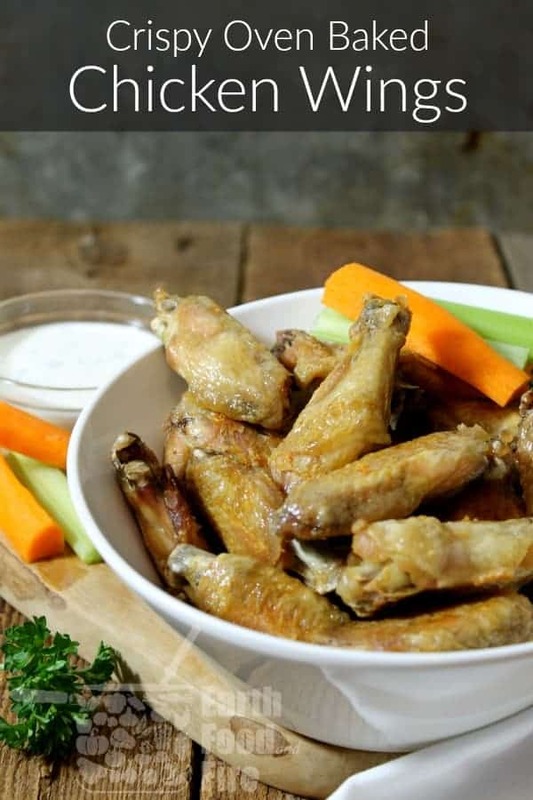 If you are just straight baking the wings tossed in seasonings and oil, you'll need to bake them for 30-40 minutes at about 400F to get them crispy, or bake them for 40-50 minutes at 350F while turning periodically. If you are tossing the wings in baking powder (not recommended, see notes above ), you'll need to first bake them at 250F for 20-30 minutes first, then raise the temperature and bake them another 40-50 minutes at 425F.